This case series reports on the efficacy and safety of a less invasive posterolateral approach for septic thoracolumbosacral spondylodiscitis in high-morbidity patients. 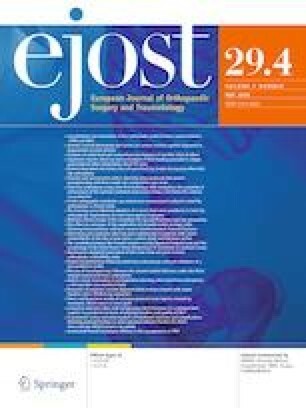 Twenty consecutive severe sick (ASA > III) patients (14 men and 6 women), with an average age of 64 ± 14 years, suffering from septic subacute and chronic thoracolumbosacral spondylodiscitis were selected to undergo a one-stage less invasive unilateral posterolateral disc space debridement, supplemented by an ipsilateral titanium cage implantation and pedicle screw fixation plus a contralateral transfascial pedicle screw fixation. Two high-risk patients with severe comorbidities (ASA stage IV and V, respectively) died on days 1 and 8 postoperatively because of non-surgical complications such as massive lung embolism and acute myocardial infract, respectively. Three patients with incomplete paraplegia (ASIA C) preoperatively were improved after the surgery to ASIA D (two patients) and E (one patient), respectively, while there was no neurological deterioration in any patient postoperatively. From the 18 patients that survived, ten patients were available for the final follow-up 8.8 ± 2.7 years postoperatively. In two patients with spondylodiscitis caused by gram(−) bacteria, the posterior instrumentation was finally removed because of asymptomatic fistula emerging from posterior instrumentation solely, 15 and 19 months after surgery. The survivals at 2.5 and 10 years with revision as end point was 87.4% (95% CI 58.1–96.7); while in the “worst case scenario” the survivals at 2.5 and 10 years were: 66.7% (95% CI 40.4–83.4%); 47.7% (95% CI 23.2–68.8%) and 47.7% (95% CI 23.2–68.8%), respectively. The less invasive posterolateral approach for disc debridement and titanium cage insertion seems to be an alternative surgery for severe sick adult immunosuppressed patients with septic thoracolumbosacral spondylodiscitis that cannot tolerate traditional open transthoracic, thoracolumbar, retroperitoneal or combined approaches. The study has been registered in the Public Registry ClinicalTrials.gov PRS with the ID: NCT03472131. All authors declare that all procedures performed in these series were in accordance with the ethical standards of the institutional and national research committee and with the 1964 Helsinki declaration and its later amendments or comparable ethical standards.